Visit the Alliances for Green Infrastructure report page. As the global water crisis mounts, countries, cities and businesses funneled billions of dollars into market-based investments that conserve and restore forests, mangroves, wetlands and grasslands to secure reliable and clean water, says Ecosystem Marketplace’s latest report tracking watershed investments, released today. 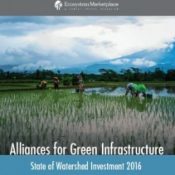 15 December 2016 | Washington, D.C. | Governments, water utilities, companies, and communities around the world paid nearly US$25 billion (B) in 2015 for nature-based solutions to secure reliable access to clean water, according to a new report from Forest Trends’ Ecosystem Marketplace, Alliances for Green Infrastructure: State of Watershed Investment 2016.